The holy grail of organic gardeners and farmers is how to build topsoil replete with organic matter, high levels of sequestered carbon and an alphabet soup of microbes and fungi. Fall is the best time to prepare for next year’s planting. While soil fertility is an ongoing topic for gardeners and farmers, there are many methods and practices that increase soil fertility. One of the main indicators of soil heath is the amount of organic matter found in soil. The ideal soil makeup is one third clay, one third sand and one third organic matter. This is self-explanatory and consists of gardening or farming without using tillage. The seeds are simply planted directly into the residue of the last crop. Adding biochar to soil helps lock up more carbon. New research from Cornell University suggests biochar may be a way to scrub carbon from the atmosphere. Prairie roots create deep soil layers that are as effective as trees in sequestering carbon. These gardens and natural areas can, over time, create inches of topsoil with the perfect community of microorganisms in a stable matrix of strong roots where erosion just doesn’t happen. 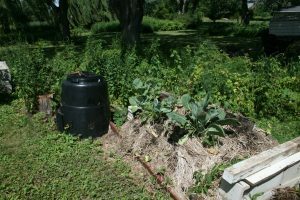 A completely sheet-mulched garden is a permaculture method that creates conditions to build up soil health and volume. Sheet mulching, also known as lasagna gardening adds layers of cardboard, newspaper, compost, leaves and woodchips. This suppresses weeds, composts on site and adds organic matter. This is another permaculture method and it is amazing. It is simply digging down into a garden site, then laying in a dense woodpile and covering it over with the soil removed from the hole. Cover the area with a straw mulch then plant or seed in vegetables. The logs slowly break down and retain moisture. A Hugelkultur bed looks like a raised bed garden and require low or no watering. These 5 methods help attract, build and feed organisms in the soil that sequester carbon and nitrogen and create conditions that allow the recharging and restructuring of soil. Caron Wenzel is an Environmental Educator, writer, and owner of Blazing Star Inc. a 26-year-old native plant seed nursery, soil amendment and environmental consulting business. You can visit her website at Blazing-Star.com.